The Harmony of the Seas looks less like a ship and more like a floating island. At 1,188 feet long with a carrying capacity of 6,780 guests in addition to the 2,100 crew members, the luxury vessel has earned the moniker of world’s largest cruise ship. The imposing ship took over 2 years to construct and cost roughly $1 billion US dollars. 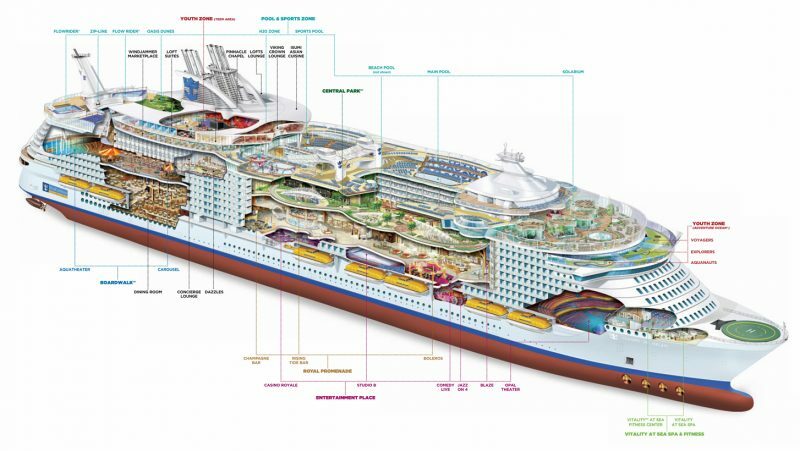 After slowly and expensively coming into being in a French shipyard, Harmony of the Seas embarked on its maiden voyage on May 15th with thousands of onlookers waving the ship off. On the morning of May 17th, Harmony of the Seas docked as expected in Southampton. The ship will continue its voyage and arrive in Barcelona on May 22nd. The ship is owned and operated by Royal Caribbean Cruises, and the company has done an impressive job in terms of providing luxury accommodations on board. At the center of the ship there is a park containing more than 10,000 plants. For those who are less interested in relaxing in nature than they are in getting their adrenaline pumping, the ship also features a 10 storey water slide known as the ‘Ultimate Abyss’. Other recreational facilities include 23 swimming pools and 2 rock climbing walls.